This morning, at around 5 am, I went out for a run. A quarter-mile into the run, I stepped on a rock. A round rock. I rolled my ankle over a little bit. 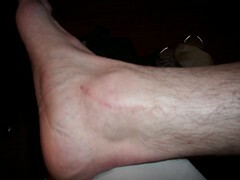 The arch of my foot is now sore, so maybe I haven't re-injured my ankle. I will take it easy for a few days and see how it goes. I almost got killed (or seriously injured) today. Crossing a side street, with the light, in the crosswalk, never suspecting that a driver wouldn't stop for a red light. He barely slowed down, intending to roll through the light, making a right on red, until I yelled at him to stop. Of course, no turn signal, so I had no idea that he was turning. I've come to believe that the right on red after stop is the worst law that this state has passed in connection with driving/cars/traffic. Most people skip the "after stop" part, and a majority don't seem to understand that they don't have the right-of-way over other cars, much less that they have to look for pedestrians, too. I felt pretty good today, made a 3.5 in 7:50 pace the whole way. I will probably go out again around 4:30 or 5:00 for another 3.5 to 4.